Fresh out our social media feeds is the latest crazy commotion in the YouTube beauty world. In case you have no idea who's involved in this beef, Jeffree Star is currently famous as an American YouTube makeup guru, artist, and brand. He has worked with some of the biggest names in the industry and has his own cosmetics line. On the other hand, Michelle Dy is currently the most followed beauty vlogger in the Philippines. As any other ordinary day in the lives of these YouTube content creators, they produce and upload videos for all of us mere mortals to consume. 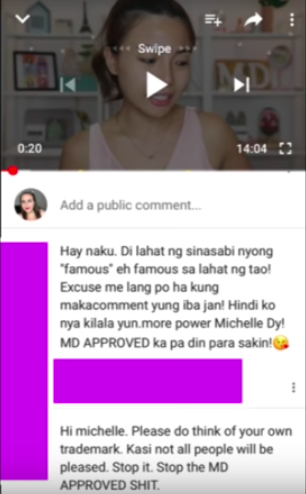 Just recently, Michelle Dy uploaded a video where she used "MD Approved" which apparently resembles much of Jeffree Star's apparently trademarked "Jeffree Star Approved" seal. Of course, Jeffree was quick to comment on this issue with videos from his Snapchat. Michelle got a good deal of bashing and has taken down the video and apologized.